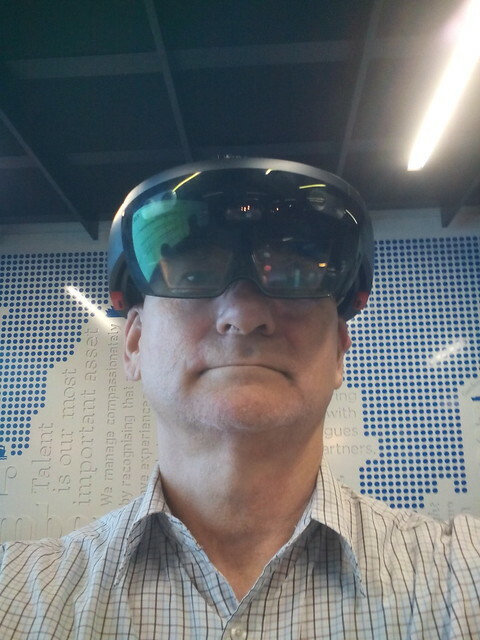 At the Instructional Design & eLearning Meetup last night at LinkedIn Sydney, I had the opportunity to briefly try Microsoft HoloLens. This was the most comfortable of the virtual reality headsets I have tried. The key feature is that the display is semi-transparent, superimposing images on what you can see around you. Also there is less of a catastrophic feeling. In addition the unit feels more balanced than other headsets which impose weight on the face. I was able with a little practice to use hand gestures to manipulate the image in front of me. But more significantly, I was still able to see and talk to people around me. The Microsoft HoloLens is still a large and cumbersome device to have on your head. We are a couple of equipment generations, and several years, from a unit which is suitable for everyday use. These will need to be reduced to the size of the MicroOptical_MyVu, from 2002, which clipped onto the side of a pair of spectacles (but lacked the sensors in the VR units). As it is you would need a good reason to use the Microsoft HoloLens, for gaming, education or work. The case for gaming with VR is clear, however, applications in education and work are less clear. There are not many situations where the immersion augmented/VR experience counteracts the impediment of the equipment. There would be limited roles in education, where the student needs their hands free. In the workplace the roles would be even more limited. Such units have been proposed for those repairing complex equipment to provide detailed instructions. However, those repairing, for example jet engines, or heart valves, do not do so untrained: they already have to have a high level of skill and knowledge. One obvious use is in defence and security applications. The technology in consumer VR headsets could make the units affordable for more than just fighter pilots (and the VR headsets for the F-35 are not working too well anyway).